Southwest Pensacola location! 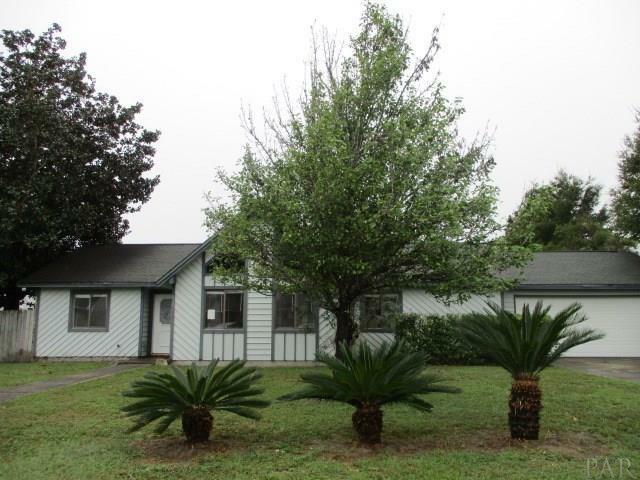 Close to Military Bases & all Amenities too! 3 Bedrooms, 2 Bathroom featuring Soaring Cathedral Ceiling with Decorative Crowning in the Great Room & Formal Dining Room Plus Brick Fireplace! Desired Split Floor Plan with Spacious Master Bedroom & Walk-in Closet! "Galley Style" Eat-in Kitchen ~ Built-in work table in the Attached 2 Car Garage! Open Back Patio in Fenced Backyard perfect for "grilling out"! Don&apos;t Listing Agent has taken all of the information from the County Property Appraiser&apos;s website. While the Listing Agent does believe that the acquired information is accurate, the Buyer and/or Buyer&apos;s Agent should verify all pertinent details related to this property, including but not limited to parcel dimensions, acreage, school zone, zoning classification, land use & any other information that may affect the Buyer&apos;s decision to purchase this property. Miss Touring this Home Today!